For many years working on the Tay I'd notice a distinct difference in the numbers of fish that would appear the minute we hit mid March and the frequency of these runs. In the right water conditions I would always score from the boat or from the riverbank even if that fish appeared with the last cast of the day. I recall a few occasions having days of 4 or 5 'springers' during March when the Spring run on the Tay wasn't doing as well as it does today. On one of those days fellow Tay ghillie Gordon Pollock and I entertained 4 building trade guests with 5 perfect March springers before lunch! Needless to say the lunchtime celebrations were far too 'extensive' to increase the catch in what was left of the afternoon! My confidence levels used to go through the roof at that time of year and then 'sleep deprivation' kicks in the closer we get to April & May when there's resident Spring salmon in all the pools and 'new models' sneaking up through them each day. My goodness this period is indeed a very special time of year and although I took the career decision to come 'off the tools' in October 2016 to release my time to focus 100% on raising the much needed presentation & marketing of Scottish salmon fishing I always feel my boots 'wheel spinning' in the direction of the Tay as we get closer to the middle of February. When working professionally as a ghillie you'll learn loads about Scottish salmon fishing by studying the salmon fishers who are often inconsistent in their salmon fishing approach than ever worrying about salmon which are much more consistent with their presence. What I mean is that from mid February and for the following 14 weeks there's nothing more consistent than the runs of salmon that enter and ascend the Tay. 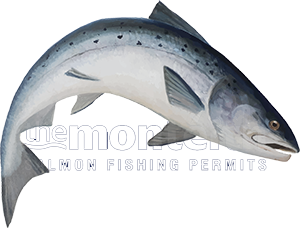 Our job as salmon anglers is to cover the water as well as we can each fishing day and unfortunately unless there's talented anglers in the party or a persistent ghillie this vital salmon pool water coverage often doesn't happen consistently enough. It's easier for me or for anyone who's spent a long time on the river to have absolute 'faith' in the presence of salmon and have the confidence to genuinely feel they are going to catch a fish on all fishing days whether that happens or not. A new or part time salmon fisher who lacks that 'faith' in the river or their own fishing skills can quickly allow their head to go down or 'switch off' from the quality water coverage required for success. This is why a good grounding in salmon fishing tactical skills (especially riverbank movement) is so important as is total initial blind 'faith' & satisfaction from the daily fishing attempt regardless of the outcome. The only time to switch off is at 5pm but before you do always have one last cast for the road! Sometimes in salmon fishing there's a 'taker' waiting for the very first cast of your fly or a run of salmon all of a sudden appears in the pool you're covering which obviously makes the task in hand much easier. Most of the time though in salmon fishing you have to be very thorough & tactful with your approach to catch a fish. Effective fly or lure control paired up with strategic well spaced water coverage are the main components that will grind out a result when salmon aren't queuing up for an interview! Look on each fishing hour in the morning or afternoon fishing session as a valuable 'water coverage' proposition and don't waste time. Become a riverbank water coverage machine and enjoy the natural surroundings until the inevitable tug on the fly reel 'super charges' your focus!